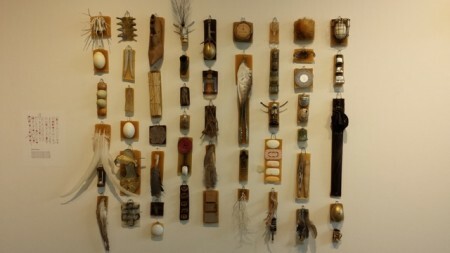 The Dayton Visual Arts Center presents four artists in a themed exhibit entitled “Remnants” that seeks to message re-actualization, memories and dream-visioning with the detritus and castoffs in life. The rising tide of accumulating residue in our lives both domestic and at the work place is undoubtedly a common experience. Even when we have tidied up for a fresh start, we encounter the dust covered letter or some other shadow of memory that overturns that notion and points to the backwater of our conscious and unconscious life. Most striking in the first room of the exhibit is Christina Pereyma’s vertical wall exhibit “Remnants” 2016, a mixed media piece that anchors the exhibit. Pereyma has assembled found objects in a unique virtual cabinet -like format mingling the quotidian with the exotic. Each element is partially embedded in a bar of beeswax, an element that in itself is associated with preservation and survival in previous generations. In another serial work, Susan Byrnes experiments with the ‘physical footprints’ of objects in time and space. She has a series of clutches and a wallet as well as a series of bottle impressions a la morandi, backlit on a gallery ledge. By casting the object into high heat processes involving glass or iron, she exhibits literally what is left behind, as the original object is destroyed in the processes. Cincinnati based, Kate Kern, confronts the visitor with an installation of “1000 Eyes”. The work consists of a series of edited eyes in photocopy toner over pencil on card catalog cards, (remember those?) hung in parallel but free floating wall format. She extends the library reference in another piece entitled “Guest Guide Book”, a 4 drawer card catalog reference file filled with cards bearing partial messages and word snippets the meaning of which is up to the willing participant to surmise. Francis Schanberger works in photographic image in a process known as anthotype. Using staining plant pigments, he creates fragile, positive impressions of delicate laces and intimate sleepwear. These pieces will eventually completely fade in overexposure to light, alluding to the elusive quality of dreams and waning memories. My favorite was “Trojan Peignoir”, a dark purple iris anthotype floating on a warm colored 43×35″ sheet. “Resonate” is a juried members’ show juried by Eileen Carr and Christina Pereyma. The jurors’ statement professes searching for an overarching relationship of these pieces to the Remnant Exhibit. 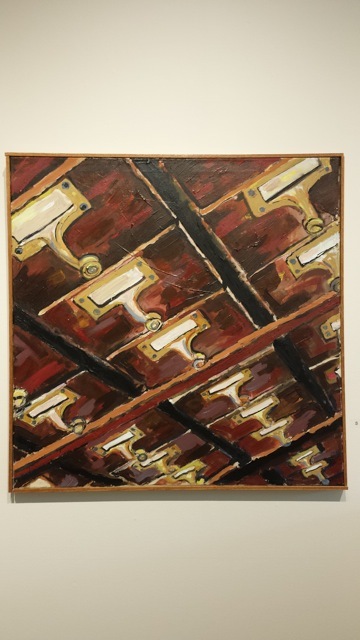 This reviewer considered 2 pieces: ” Will our kids know?” is an acrylic painting of a skewed view of a vertical card file punctuated with the brass fingerpulls unique to the utility file. John Emery shows “Fabritius Flight” a watercolor/construction piece. 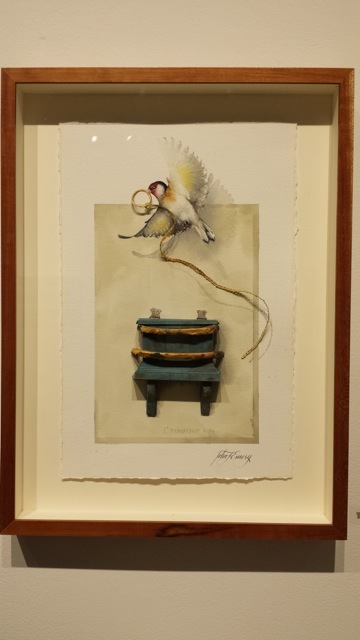 A high realism watercolor of a small finch in free flight with a chain ribbon in his beak, is combined with a 3D replica of the double perch bluegrey wall box famously depicted in the Carel Fabritius “The Goldfinch” of 1654. The little bird in the Fabritius original, chained to his feed box, is a recognized masterpiece of tromp l’oeil illusionism by the Dutch master. Emery’s work, which is beautifully executed, visually puns the composed entrapment with a contemporary’s flight of freedom. 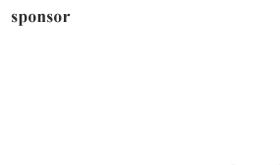 This reviewer felt mildly drawn to the exhibition. The Pereyma work was most interesting in its eclectic assortment and was ultimately the strongest purveyor of the stated exhibition intentions. Marlene Steele, paints and teaches in Cincinnati Ohio.